Since the Middle Age, when entire cities burned, the human race has learned a lot and has continuously strived to prevent and contain fires. However, these efforts have been offset by additional sources of ignition and increasing fuel loads. Nowadays, almost every home and company has computers, TV, halogen lights, coffee machines and other electrical appliances like heating and air conditioning. Most of these devices include a power supply and other electronic modules, which are potential sources of ignition. But fire can be also deliberately caused. The percentage of pre-meditated fire is between 25% and 40%,and it is still increasing. These deliberate fires often spread quickly and its extinction is extremely difficult. 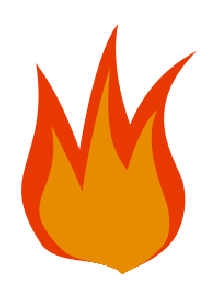 On average, this type of fire is three times more expensive than a standard rate of fire. In our sumptuous society, buildings are decorated with textiles, carpets, etc… more and more luxurious. Furthermore, the use of synthetic material, diecast moldable and easy to process increase permanently. Apart from increasing the fire load, these substances are highly flammable and they react as fire accelerators. This effect is much more catastrophic than the fire load. Moreover, buildings are becoming more and more complex having more rotation and movement of people. A huge fire release large amounts of energy. A fire in which 3 g of paper burned per second it would generate 40kW and a height of 0.8 m flames. In addition to heat, any fire, whether large or small, produces toxic waste and highly toxic gases. These gases contain, among other substances, carbon monoxide, hydrochloric acid gas, chloric gas, various sulfur compounds, nitrogen oxides (NOx), hydrocyanic acid gas and many other highly toxic substances, including phosgene. The loss of life and financial damage caused directly or indirectly by these gases it is consequently high. Despite of this, there is also a great number of options to protect any element and people from fire. There is a wide range of passive fire protection products and systems to meet that need without having to act when a fire occurs. On the other hand, active fire protection can help us to extinguish flames, doing an active pressure on the fire to extinguish it and avoid ingirreparable damage and death of people.